When I lived in in Shelby Township for a short period of time I often longed to be more involved in Detroit. I wanted to go to events, go to cool restaurants, and in general just know where I should spend my time. Sometimes to an outsider, no matter how close you live to Detroit, it can feel a little daunting. Below are some of the “tips and tricks” that I have learned only after living here for 6 months. Free yoga IS a thing. If you’re like me and want to save a little bit on exercise, and yoga at home just won’t cut it, then I suggest going to Citizen Yoga for their Community Class or MOCAD (Museum of Contemporary Art Detroit). They both offer free yoga every Sunday. If there is an event at MOCAD & you are even somewhat interested — then you must go. This one is really simple. Every time I have gone to any exhibition or gallery event I had a blast. You usually have to pay to get in which is a bummer. Just frequent their Facebook to get the scoop on the next upcoming thing. Don’t let the rough exterior of Temple Bar scare you away. There is magic inside. Go with your adventurous friend. Save your first night for Haute to Death, which is a dance party they host the third Saturday of every month. Same goes for Old Miami. Go for Nothing Elegant. A monthly dance party on the second Saturday of every month. “Ladies on the decks and shenanigans on the dance floor”. There are so many great concerts happening in Detroit that are relatively inexpensive. The Majestic, St.Andrews Hall, El Club. If you appreciate music, then there is no doubt you wont find something unexpected that you would love to watch live for under $30. Other great places to just see live music: Old Miami, Northern Lights Lounge, Cliff Bells. If you’re a creative and you are not going to Drinks x Design, then you are making a mistake. Drinks x Design put on by the Detroit Creative Corridor Center (DC3) is a monthly design networking event, while also allowing creative businesses open their doors and share their work with the community. It is held the third Thursday of every month in a new location. Drinks are always provided! While you are at it, you should also follow everything DC3 does because they are doing big things like helping Detroit become a UNESCO City of Design. I know that long time Detroiters have a much different list then I do, and they may kill me for this. I have really only gone to the most popular places, but I still have my preferences. This is a Detroit born sport that is just too much fun. This is another place with a rough exterior but don’t let it stop you. You’ll be surprised how packed this warehouse can be on a weekend. Need the perfect Saturday? Want to see every part of Detroit? Here is how I would spend it. Grab some coffee and breakfast at Roses Fine Food. Head to Eastern Market (Park on the corner of Russel and Wilkins. Make sure you go to Detroit Hustles Harder and buy yourself some awesome gear and take a look at all the murals. Eat lunch at Mudgies. Walk around Midtown and visit Nest, City Bird, Third Man Records and Shinola. Get some happy hour drinks at Hop Cat. Go to Belle Isle and watch the sunset. Depending on the Saturday of the month, go to Old Miami, or Temple Bar, or the faithful Greektown (Old Shillelagh or Firebird). 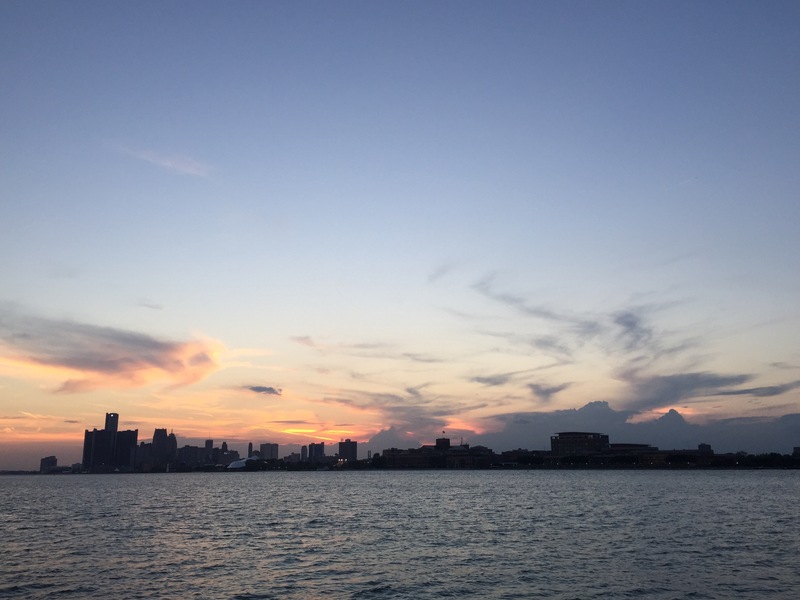 Looking for the best views of Detroit? Here are the best. Well I would say Coach Insignia at the top of the Renaissance Center (71 and 72 floor), but they just closed a week ago. I believe it wont be long before some other restaurant takes it over, so when they reopen, then go. Second best, top of the Z Lot. It also has a very cool alley with some restaurants & murals. Also the rooftop of the [email protected] Building but I am not sure if this is open to the public? It is worth it to look into it.